As I type this I’m sitting in the shade on the grassy terrace of the Concordia Motel in Skardu. 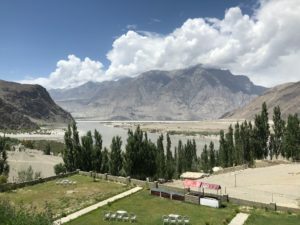 It is quiet and tranquil; birds chirp in the Cyprus and poplar trees, and the wide expanse of the Indus River snakes lazily down the valley below me. All around are impressive craggy mountains, many with snow capped peaks. The Kharphocho Fort commands an impressive position of overwatch above the confluence of valley and tributaries which feed a river which starts in Tibet and flows to the Pakistan coast, discharging a volume of water into the Arabian Sea twice that of the Nile. The Indus also represents the gap between the Himalayas and the Karakoram mountain ranges. Skardu represents the gateway for much of the adventure in the Karakoram. At an altitude of over 2200m, and a population of nearly half a million Skardu is a major hub in the north of the country. Whilst looking out over the river, it is somewhat sobering to think that this vista has hardly changed since the Duke of Abruzzi commenced his 1909 attempt to climb K2 from here. Of course what has changed is the method of reaching Skardu. The earliest expeditions would have had to make the journey of hundreds of kilometres on horseback or foot. The Karakoram Highway, which was built during the 60s and 70s at a cost of over a 1000 Pakistani and Chinese lives, was completed in 1979 and opened to the public in 1986. From Islamabad to Skardu, a distance of around 700km, it takes up to 40 hours, depending on the weather and the condition of the road, which is frequently blocked by landslides. Fortunately for us, we were able to reduce this to only 45 minutes by flying direct from Islamabad to Skardu. Having driven the KKH 3 times before, I was in no rush to have to drive it once again, despite our leader announcing to the group that it’s the most beautiful drive in the world. I can’t completely disagree, but give me a short flight any day. 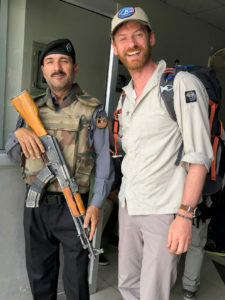 I’d arrived safely (and with all of my kit, which is always a blessing) in Islamabad at 0345 on Saturday morning, and was driven to a guest house to meet the rest of the team. Our ‘team’ is a mixture of 3 different groups: all with different objectives, but travelling under the same set of permits. The leader, Dan Mazur is a hugely experienced mountaineer and expedition leader, having spent much of his life organising trips to many of the highest mountains in the world. He himself summited K2 in September 1993 with the first Briton to summit and safely descend (Jonathan Pratt), and has dozens of expeditions to the Everest and K2 region to his name. The K2 team: Dan, myself, and Tomo, a Slovenian climber who summited Everest from the north in 2016 (with a great friend of mine, Sean). The Broad Peak Team: Bond, a young Chinese climber who is currently studying architecture in the USA; Dimitri, a Russian American physicist; and Sauri, a female Japanese climber who’s just come straight from summiting Everest. 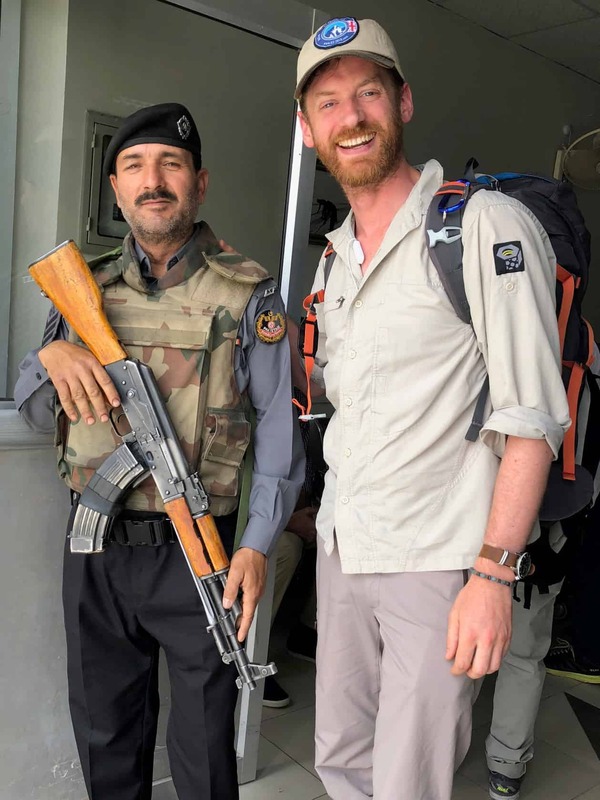 There was a fourth climber from the US, who sadly within 24 hours of arriving in Islamabad injured himself, and has already been evacuated back home. Incredibly unfortunate for him, with his trip ending before it had even begun. The Trekking Team: We’ve got a team of 4 trekkers from the US, David and Deborah, Terry and John. They’ll be coming into BC with us, before heading back out, so their trip will be around 25 days in total. We’ve got 6 Sherpas who drove from Nepal (with Dan and all the kit) a few days ago, as well as a small group of Pakistani guides, cooks and assistant cooks. We’ll pick up the porters in Askole, which is where the trek into basecamp will start from. As I finish writing this, the sun has set, the temperature has dropped and the wind has picked up. The evening call to prayer is billowing out from a mosque nearby, with echos from other mosques starting up all throughout the city, like an echoing Mexican wave of soulful choruses. A lone cow grazing on the river bank below seems to be answering the call to prayer – ‘Allahu Akbar’ being returned with a doleful bovine exclamation.